1. Smoking is not permitted in any building on parish property. 2. Alcohol is not permitted on parish property, with the exception of Sacramental wine used for the celebration of Eucharist at Mass. 3. Parish property (hall, parking lot, narthex) is off limits for non-parish fundraising activities. This includes sales of candy, pizza, raffle tickets, etc. to support non-parish groups (Girl Scouts, pom poms, band, etc.). Soliciting for Youth Ministry, St. Ann Council of Catholic Women, the Annual Chicken Dinner Raffle, the Knights of Columbus and St. John Neumann School fundraisers will be permitted but only through use of a table offering passersby the opportunity to participate. No face to face or direct soliciting is allowed. 4. No parish property is available for rent. Contact the Knights of Columbus for rental of tables and chairs OR a hall. 5. The use of skateboards, roller blades, roller skates, bicycles, scooters, etc. on parish property is not permitted (except for parish-sponsored events) due to insurance regulations. 6. The placing of flyers on cars in the parking lot is prohibited. If flyers are found on automobiles after Church events, they were placed there without the permission of the pastor, a permission that usually will not be given. Faded, dirty or unsightly decorations (these will be removed at any time). Christmas wreaths or ground blankets may be placed on the ground near the headstone during the Christmas season but must be removed by January 15. Consumptions of alcoholic beverages on cemetery property is not allowed. Liability – Cemetery Board, Cemetery Manager, or St Jerome Parish is not liable for thefts or damage to grave markers/headstones or memorial items placed on cemetery grounds. Leave items only at your own risk. The sacrament is called baptism from the Greek language meaning “plunge” or “immerse.” Through the plunge or immersion into water, the burial into Christ’s death and promised resurrection are celebrated. Because parents are the primary teachers of their children in the ways of faith, when infants and children are presented to the Church for baptism, it is the parents who must be actively living their faith. Evidence of this practice includes what the Church calls precepts. First among these is participation at the Sunday Mass on a weekly basis. This is the Lord’s Day for the Christian. It is kept holy by celebrating the Memorial Meal and Sacrifice given to us by Jesus: the Eucharist. Through this sacrament we are strengthened and nourished to live our baptismal faith. When this active practice of the faith is lacking, baptism may be postponed until there is the necessary assurance that the sacrament will not be celebrated in vain. For those parishioners wishing to celebrate the baptism of an infant, a pre-baptismal preparation session is required. These sessions are scheduled every other month, and should be completed prior to the birth of a child. It is necessary to call the parish office at (618) 667-6571 in advance to register for a session. Pre-baptismal sessions are normally scheduled on Tuesday evenings from 7:00 p.m. - 8:30 p.m. in the basement of the church (St. Joseph Hall). It is very important that both parents (Catholic and non-Catholic) attend the session. Godparents are encouraged to attend as well. Godparents must be Catholic, at least 16 years old, already confirmed and have received Eucharist. Testimony, from the pastor(s) of the Catholic godparent(s) to their active participation in the faith, is required two weeks prior to the date of baptism. While two may be chosen, only one Catholic godparent is required. A person of another Christian faith may be chosen as a Christian witness to the baptism. This is discussed in more detail during the pre-baptismal session. Because baptism is the first sacrament of initiation, when one becomes a member of the Church through water and the Word, it is essential that the local Church be represented. Therefore baptisms at our parish normally takes place within the context of Sunday Eucharist when the community is more fully gathered in prayer. In this way the entire faith community embraces the newly baptized as one of the fold. Because of the emphasis placed on the involvement of the local parish community in baptism, it is the policy of our parish that those seeking baptism for their children be active and participating in the parish for at least four months. In this way the parish community and the new family can come to know each other. The Rite of Penance, first announced by the Congregation for Divine Worship in 1973, was broadly implemented in the United States during 1976. The Sacrament of Penance and Reconciliation brought with it a unifying emphasis on the ministry of reconciliation. “By the hidden and loving mystery of God’s design people are joined together in the bonds of supernatural solidarity, so much so that the sin of one harms the others just as the holiness of one benefits the others. Penance always entails reconciliation with brothers and sisters who are always harmed by our sins” (5, Rite of Penance). The familiar parts of the sacrament — confession, sorrow, absolution, and penance — remain the parts of the Sacrament of Penance. But these separate moments in the sacramental action all work toward reconciling person to person, person to God, and people as a whole to God. The Sacrament of Penance and Reconciliation also emphasizes that in continuing the reconciling and healing ministry of Jesus, the Church is “at the same time holy and always in need of purification . . . (and) constantly pursues repentance and renewal” (3, Rite of Penance). The National Directory for Catechesis tells us that, “Since conversion is a lifelong process, catechesis for the Sacrament of Penance and Reconciliation is ongoing. Children have a right to a fuller catechesis each year.” (36.B.2.) The Rite summons us to celebrate the whole reconciling ministry of baptized Christians. This involves our everyday attempts at reconciliation and union. In this Sacrament we celebrate the continuous, forgiving love of God, and we continue our work of turning toward God. First Penance introduces children to a more conscious, active participation in the sacramental life of the Church. A child's experience of first penance is a simple, but vital, beginning. The process of preparation for this segment is carried on in three places - the home, the parish, and in a religious education system. Although parish celebrations of reconciliation are adult celebrations, the parish community nurtures its children and calls them to grow by including them. As they mature, children will deepen their understanding of reconciliation by participating in these celebrations. Family life is foundational to all these experiences. Children first learn attitudes of forgiveness at home, in the family circle. There they establish patterns on which they build for the rest of their lives. 1. 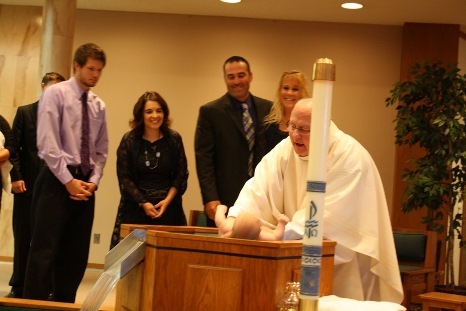 Be baptized and already practicing the Catholic faith at a level appropriate to their age. 2. Are participating in the parish stewardship process according to age and ability. 3. Have a desire to enter into the process. 4. Have successfully completed one year of the parish faith formation programs, (PFF, Parochial School, or HFF) and be currently enrolled and participating in one of these options. Mandatory preparation sessions for parents. Periodic liturgical ritual celebrations within the Sunday Mass. Timely completion of the parish Reconciliation Preparation Materials. Experience the parish communal celebration of the Sacrament of Penance with their family. Retreat Day for children and parent/s. Celebrate the Sacrament of Penance prior to beginning preparation for First Eucharist. "Since the Eucharist is the 'source and summit of the Christian life,' (Lumen Gentium, 11.) catechesis for the Eucharist recognizes it as the heart of Christian life for the whole Church, for the dioceses and parishes, and for each individual Christian." (National Directory for Catechesis 36.A.2.) All that belongs to Christian life leads to the Eucharistic celebration or flows from it. Because of its communal nature parents alone cannot fulfill the responsibility of initiating their children into the Eucharist. We recognize this and incorporate not only parents but also the Parish staff, prayer partners, catechists, Liturgical Ministers, and the entire worshipping community. The preparation process at St. Jerome recognizes the diverse but complementary roles that must be fulfilled if children are to grow in faith. We emphasize the need for parents to be actively involved in the preparation process. Faith Formation is not simply a matter of handing on religious facts but initiating deeper into the faith, attitudes and values of the Christian community. Young children learn attitudes and values through identification with those adults influential in their lives. For that reason we affirm that parents are the first teachers of their children. Parents teach informally but powerfully by example and instruction. Because parents are the primary educators of their children in ways of faith, when children are presented to the church for First Eucharist, it is the parents who must be actively living the faith, including what the Church has traditionally called PRECEPTS. First among these is participation at the Sunday Mass on a weekly basis. This is the Lord's Day for the Christian. It is kept holy by celebrating the Memorial Meal and Sacrifice mandated by Jesus. When this active practice of the Catholic faith is lacking, Eucharist preparation may be postponed until there is the necessary evidence that the reception of this sacrament will be the beginning of a weekly practice. 1. Be baptized and practicing the Catholic faith at a level appropriate to their age, including weekly participation in Sunday Liturgy. 5. Have successfully completed the First Penance preparation and celebrated the Sacrament of Penance and Reconciliation. Timely completion of the parish Eucharist Preparation Materials. The preparation for and celebration of the Rite of Confirmation is an exciting time in the life of St. Jerome Parish community. At whatever age candidates celebrate this sacrament, many people gather to offer care and support. Everyone, including candidates, their families, their sponsors, their peers, and the entire parish community are affected and included because Confirmation is a CELEBRATION OF THE WHOLE PARISH. The history of the sacrament of Confirmation reveals a variety of opinions and practices about both the theology and preparation for the sacrament of Confirmation. One form of the sacrament is the post-baptismal anointing followed by Eucharist, which seals the entire process of initiation. This is the form that is found in the Rite of Christian Initiation of Adults and is regarded as the “proper order” according to church law and ancient tradition. Another form of the sacrament is rooted in our church history. It is the practice of having the bishop ratify baptisms over which he did not preside. Because infant baptism is the ordinary practice in the church today, the separate rite of Confirmation is celebrated. This separate Rite of Confirmation began in the 11th century. Parish communities celebrate Confirmation at varied ages, from the age of discretion (“age of reason”) up to and including adolescence. The National Conference of U.S. Catholic Bishops decided that, "the sacrament of Confirmation in the Latin rite shall be conferred between the age of discretion, which is about the age of seven, and sixteen years of age..."
St. Jerome Parish celebrates Confirmation every other year. Youths, in 7th and 8th grades, who have received First Eucharist, may enter into the preparation process, along with any adults who for whatever reason were not confirmed earlier. At the very center of the sacrament of Confirmation lies the theology: in this sacrament we receive the fullness of the Holy Spirit. 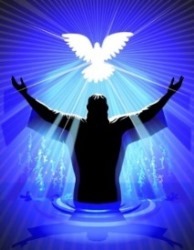 Conferring the Holy Spirit is central to the sacrament. The candidates for Confirmation believe that God gives them the fullness of the Holy Spirit and it will make a difference in their lives. That is why we choose to celebrate this wonderful gift of the Holy Spirit. Openness to the Spirit, being more like Christ, and witnessing the gospel in our daily lives is emphasized in our Confirmation preparation. In order for parents, the primary educators of their children in matters of faith and morals, to assume responsibility for the formation of their children in the sacramental life of the church we at St. Jerome involve parents in the preparation for Confirmation. As stated in the National Directory for Catechesis, "Dioceses and parishes should present catechesis for the Sacrament of Confirmation that...Ensures that parents and sponsors are involved in the catechetical preparation of the children for Confirmation." (36.A.2.) When children and adults come together for catechesis, families develop the ability to share their experiences of God with one another. Children then experience Confirmation not as an isolated incident, but as a celebration of God's presence within the entire church community. The Rite of Confirmation presumes the candidate was baptized as an infant and raised within a Christian Catholic household of faith. In the years between the celebration of Baptism and Confirmation, the rite presumes ample opportunities for catechesis (instruction about Catholic Christian beliefs), so that one may be centered on Jesus Christ and the hope of bringing about the kingdom of God according to the age and ability of the child. Preparation for Confirmation is not a time to learn or review all the Christian Catholic teaching. That learning is a life-long process. The candidate must already be immersed in catechesis and worship on a regular basis before beginning preparation for the sacrament of Confirmation. Are participating weekly in the Sunday Eucharist. Are participating in the parish stewardship process according to age and ability. Have successfully completed two consecutive years of parish faith formation programs, (PFF, Catholic Parochial School, Youth Group, or HFF) and be currently enrolled and participating in one of these options. Have successfully completed the preparation programs for First Penance and First Eucharist. Mandatory preparation sessions for youths, parents, and sponsors. Periodic liturgical ritual celebrations within the Sunday Mass. Timely completion of the parish Confirmation Preparation Materials. Retreat/Rehearsal Day for youths, parents, and sponsors. St. Jerome’s religious formation efforts, at root, aim to communicate the fullness of life in Jesus, in light of the life-giving riches of our Catholic tradition. We offer PFF for parishioners in Pre-School, Elementary and Middle School. All Elementary (grades K through 5), and Middle School aged students (grades 6 through 8), who do not attend a parochial school, are expected to participate in PFF or HFF. High School students as well have the Home Study opportunity. Registration is held over the summer, with a fee charged to cover materials. Parents enter into a covenant with the catechists to partner for the flourishing in faith of our children. PFF for Elementary School children is held on Wednesday evenings, with a choice of 4:15-5:30 p.m. or 6:15-7:30 p.m.
PFF for Middle School youth, designed as faith-sharing in a small Christian community, is offered on Wednesday evenings from 6:15-7:30 p.m. Youth Group participation is also highly encouraged (Sunday afternoons) plus special activities for prayer, community-building and service. Regular participation in Youth Group fulfills the Religious Formation aims. St. Jerome Youth Ministry includes a catechetical component on Sundays. Additionally, a Home Study format is available for those students whose schedules cannot accommodate the Sunday-scheduled Youth Ministry Program (see below). Parents may choose to catechize their children at home in lieu of PFF. The Home Study materials are the same as PFF, and the process follows the schedule of PFF. Parents gather initially and periodically with the Pastoral Associate for Faith Formation to share insights, struggles, affirmations, and best practices. The Pastoral Associate for Faith Formation is responsible for all faith formation processes. She may be reached at the Parish Office, 667-6571 Ext. 13, or through email at slindamary@stjeromeparish.org. In humble service to God, we are committed to providing the highest standard of Catholic faith formation and academic excellence for the children God has entrusted to us. The Parish of St. Jerome provides the opportunity for a Catholic elementary education at St. John Neumann School, the tri-parish (Mother of Perpetual Help in Maryville; St. Cecilia in Glen Carbon; and St. Jerome in Troy) Catholic School located in Maryville, Illinois. The school offers two tuition rates: a parish rate and a non-parish rate. You must have been registered and active* in St. Jerome parish for at least 6 months. Your children must be baptized and attending Sunday Mass with you on a weekly basis. Catholic formation in the school reinforces and supports the formation through the Eucharist and faith community. You must be using the Sunday envelopes to contribute to the support of the Church as your means allows. A minimum of $800.00 contributed during the last calendar year is expected. Donations of time and talent are also expected to be shared with the parish and the school. Exceptions granted by the Pastor are to be renewed each year. You are expected to participate in the programs of both parish and school as time permits. Participation in the major fundraisers for school and parish is mandatory: the Dinner Auction, Market Day and/or Scrip, the St. Jerome Chicken Dinner, etc. If circumstances arise during the year which makes any of these expectations impossible, please contact the Pastor at once, so that the school can be notified. Those who do not meet the above listed qualifications fully, and have not made other arrangements with the Pastor of St. Jerome Church, will be charged the non-parish tuition rate. Attendance and Participation at Sunday Mass. Stewardship of Time, Talent and Treasure. Participation in any required (parent) meetings. Observance of the Precepts of the Church. The Church has never wavered in its insistence on the primary role of parents in the education and religious formation of their children. Catholic schools and religious education programs do assist in this responsibility but can never substitute for the word and example of parents. Preparation for sacraments for children attending St. John Neumann School is to take place by the parents. The parish of one’s membership will provide opportunities for parents to enhance their own experience of faith, as well as provide tools for the education and formation of their children. The religious curriculum of St. John Neumann will supplement this family catechesis, but will not substitute for it. St. Jerome Parish will provide parents with necessary information regarding parent meetings, as well as celebrations prior to the reception of the sacraments. Please contact the parish for details. The actual celebration of the sacraments of First Penance, Confirmation, and First Eucharist are to take place in the parish where one worships every Sunday. St. John Neumann may provide an additional worship service and/or reception to honor those who have celebrated the sacraments at their home parish. St. Jerome children who attend St. John Neumann who have never been baptized and wish to be will be expected to participate in the Rite of Christian Initiation of Adults at the parish. St. Jerome children who enroll in St. John Neumann after the first grade who have been baptized, but have had no formal religious formation, and wish to celebrate the sacraments of Penance, Confirmation or First Eucharist will be expected to participate in the Rite of Christian Initiation of Adults at the parish. Catholic children who attend St. John Neumann School but do not belong to one of the three sponsoring parishes should inquire at their respective parish as to the procedure to follow for sacramental preparation. These parents may be asked to participate in one of the preparation processes at St. Cecilia, Mother of Perpetual Help or St. Jerome. The pastor of one’s respective parish will offer guidance in this matter. The Rite of Christian Initiation of Adults is the Church’s method of journeying in faith through a process of discerning and ritualizing stages of gradual conversion. Initiation of adults belongs to all the baptized. The process is about fostering a relationship over time with both God and the Catholic community through formation and information. It is the catechetical and liturgical means for individuals to become Catholic through the reception of the Sacraments of Initiation, namely Baptism, Confirmation, and Eucharist. This initiation process is served by the Pastor, the Pastoral Associate for Faith Formation, the Director of Liturgy, the Catechetical Team, and Sponsors. The process also involves the parish community who, through their own renewal of faith, prepares and welcomes new members into the Church. The Rite speaks of conversion as a “spiritual journey” centered on nurturing a relationship with Jesus through the Church, the People of God, infused by the workings of the Holy Spirit. This journey takes place through distinct stages over a period of time suitable to bring about transformation along with a basic understanding of Catholic Identity thorough catechesis, interaction with the parish community, and commitment to the liturgical and moral life of the Catholic faithful. The RCIA process is a restoration of the ancient Catechumenate called for by the Second Vatican Council. The RCIA process is designed for those who are 7 years old through adulthood, who have never been baptized, or were baptized in another faith tradition, or were baptized Catholic but have not completed initiation through the usual catechetical process. The time varies, but is rarely shorter than 6 months or longer than 3 years. We respect the time each person needs for conversion and decision. The RCIA text gives guides for discerning this on a case by case basis. Expectations of Catechumens (the unbaptized): 1. Participation in the Rites and Rituals of the process. 2. Commitment to weekly dismissal and catechetical sessions. 3. Participation in a retreat experience. 4. Development of a prayer discipline. 5. Interaction within the parish community. 6. Discernment of gifts of stewardship of time, talent, and treasure. 7. Participation of spouses and/or fiancés in weekly catechetical sessions. 8. At least one liturgical year of participation. Expectations of Candidates (those already baptized): 1. Participation in the Rites and Rituals of the process. 2. Commitment to weekly dismissal and catechetical sessions. 3. Participation in a retreat experience (if applicable). 4. Development of a prayer discipline. 5. Interaction within the parish community. 6. Discernment of gifts of stewardship of time, talent, and treasure. 7. Participation of spouses and/or fiancés in weekly catechetical sessions. 8. Time in the process is determined by the history of the participant. Expectations of Sponsors: 1. Active parishioners who are appointed to serve throughout the process. 2. Participation in the Rites and Rituals of the process. 3. Commitment to participate in weekly catechetical sessions. 4. Walk with their Catechumen or Candidate as a Mentor/Companion. The process begins with an initial interview with the Pastor and the Pastoral Associate for Faith Formation. Discernment of readiness to progress throughout the process is determined by the Pastor in consultation with the Pastoral Associate for Faith Formation in conjunction with the RCIA Catechists and Sponsors. Those catechumens and candidates who are working through the annulment process may begin the RCIA process with the understanding that the annulment process must be completed before reception of the Sacraments of Initiation can be received. The more the Church becomes reacquainted with the RCIA the more we will understand faith formation as ongoing, as belonging to cradle Catholics and those who are initiated during later seasons of their lives. The process of initiation is never ending. The more the Church participates, the more we deepen our grasp of our participation in the paschal mysteries of Christ. Initiation is only the beginning of a lifetime of formation for new initiates and the all the baptized to derive new perceptions of faith, of the Church, and the world. Initiation is about life after baptism. It is vital to all the baptized people of God. The desires expressed by many (newly initiated) for more formation should demonstrate the need for parishes to have ongoing faith formation opportunities for all adults. The U.S. bishops' publication in 1999 of Our Hearts Were Burning Within Us: A Pastoral Plan for Adult Faith Formation in the United States should be a means of developing and strengthening this effort as it is implemented in dioceses and parishes across the country. Please read this entire policy document before contacting Fr. Kevin or Deacon Bob to schedule your first preparation session. A good deal of paperwork is done here. The priest/deacon interviews each spouse-to-be to determine freedom to marry. Non-Catholic Christians should bring documentation of baptism (a photocopy of a baptismal certificate or a letter from the church of baptism will suffice); Catholic Christians should be able to supply information on the parish of baptism. Each spouse-to-be completes an online marriage inventory, the results of which are the basis for discussion in subsequent appointments with the priest/deacon. The couple signs up for and participates in a Pre-Cana, remarriage day, Engaged Encounter or other formal preparation program. The priest/deacon presents an instruction on the theology of marriage. Hour-long sessions (number of sessions indeterminate) for the sake of reviewing the results of the marriage inventory. For the sake of planning the wedding liturgy, particularly the music. To review the details of the wedding liturgy (usually about a month before the wedding). The matrimonial covenant, by which a man and a woman establish between themselves a partnership of the whole of life, is by its nature ordered toward the good of the spouses and the procreation and upbringing of offspring; this covenant between baptized persons has been raised by Christ the Lord to the dignity of a sacrament. Pastors of souls are obliged to see to it that their own ecclesial community furnishes assistance to the Christian faithful so that the matrimonial state is maintained in a Christian spirit and makes progress toward perfection. To this end, the Parishes of St. James and St. Jerome present the following policy. The elements of this policy are based on the norms of canon law and the day-to-day experience of those who work professionally with couples preparing for marriage. It must be said at the outset that the Catholic Church does not recognize among its clergy any competence to assist at (officiate) the marriage of two non-Catholics. For a marriage to be solemnized in the Catholic Church, at least one party to the marriage must be a Catholic Christian. Catholic Christians must have a parish affiliation. A Catholic must register in the parish in which he or she lives. The boundaries of St. James and St. Jerome. If you are not a parishioner of St. James or St. Jerome, I need the permission of your own pastor so that our priest or deacon may assist at your wedding at St. James or St. Jerome. Entrance into the married state is an irrevocable, lifelong commitment. Marriage is a vocation: a response to a call from God. This call and response must be discerned carefully; the enormous demands of this new state of life, and one’s readiness to meet these demands, must be appraised realistically. Therefore, ample time is needed for the pastoral minister(s) and the couple to engage in the process of pastoral preparation for marriage. We ask for a minimum of six months’ notice before the anticipated time of the wedding, so that sufficient pastoral help can be given. We encourage couples to contact us as soon as the decision to marry is made. We are happy and eager to share with you your journey toward marriage. When one or both spouses-to-be live far away from the place of the celebration of marriage, marriage preparation is routinely done in the place most convenient to them. The priest/deacon preparing the couple stays in contact with the priest/deacon who will assist at (officiate) the marriage celebration. The couple normally has a series of meetings with the priest/deacon. First he interviews the parties separately, and through a series of questions he makes an initial determination of each party’s freedom to marry. He administers an inventory, the results of which serve as material for discussion in subsequent meetings. He gives a basic instruction on the theology of marriage. Toward the end of the series of meetings, he discusses the particulars of the wedding ceremony. For the initial meeting with the priest/deacon, a Catholic party should be prepared to provide information on the place and approximate time of his or her baptism. The parish staff will obtain a newly-issued baptismal certificate (with notations for confirmation, first Communion, etc.) from the parish of baptism. A baptized non-Catholic Christian party should provide documentation of his or her baptism; a photocopy of a certificate, or a letter from the church of baptism, will suffice. In the absence of such documentation, the priest will ask that parents testify to the fact of baptism. Besides the individual preparation with the priest, we require that the couple attend a formal preparation program, such as a Pre-Cana Conference or an Engaged Encounter weekend. Since marriage is a response to a call from God, an assessment of a party’s life in faith is always in order. The faith journeys of Catholics will take them in many different directions at different times. Most younger people go through a period of questioning the “givens” of their upbringing. Indeed, such questioning is a necessity for real “ownership” of the values by which one will live as an adult. Many young persons planning marriage find themselves quite distant from organized religion. As we reflect on the religious meaning of marriage, and the significance of celebrating marriage within a religious tradition, we will do all we can to relate questions of faith to the life changes to which the engaged couple is called. Since a marriage in church is meant to be an expression of faith, a Catholic party to such a marriage must be a practicing Catholic Christian. Marriages in which at least one party is a teenager call for special care. The diocesan teenage marriage policy is to be followed in all such situations. Interreligious marriages present significant challenges. (The term interreligious refers, in the strict sense, to a marriage between a Christian and a non-Christian; in a looser sense, it may also refer to a marriage of Christians of different communions.) It is not easy to maintain a “community of the whole of life” when the partners belong to different faith communities. In fact, interreligious marriages very often become the context for the development of a gradual indifference toward religious practice. Recognizing the difficulties of interreligious marriages, and with concern for the consistent sharing of a faith life with children, the Catholic party to an interreligious marriage is required to reaffirm his or her Catholic Christian faith and to promise to do all in his or her power to share the faith with the children by having them baptized and reared as Catholics. The bishops of the Province of Chicago explain: “ ‘To do all in one’s power’ recognizes the religious convictions of the non-Catholic party and implies that a decision is reached that respects those beliefs. It does not mean an absolute promise at the risk of jeopardizing the marriage itself.” (It is commonly but erroneously believed that the Catholic Church requires of the non-Catholic party such a promise. Such was the case until the Second Vatican Council [1962-1965] and the promulgation of the Declaration on Religious Freedom; in light of this declaration in its call to safeguard the religious freedom of all persons, the rules regarding interreligious marriages were modified in 1970 to protect the rights of the non-Catholic spouses to such marriages.) The U.S. Conference of Catholic Bishops, commenting on the 1970 document on interreligious marriages, taught: “It is evident that in preparing for [an interreligious] marriage, the couple will have to reach decisions and make specific choices in order to fulfill successfully the responsibility that is theirs toward their children in this respect. It is hoped for their own sake that in this matter, the couple may reach a common mind. ... If this issue cannot be resolved, there is a serious question whether the couple should marry.” In any event, an inter-religious marriage is an opportunity to live the principles of interreligious dialogue deeply and intensely on a day-to-day basis. In particular, a Catholic and a non-Catholic Christian spouse open themselves to the process of working for a fuller and deeper unity among all Christians. The decision to marry must be weighed objectively. A number of factors can cloud this necessary objectivity. In particular, premarital sexual involvement and premarital cohabitation provide a false sense of belonging to one another -- the true gift of self being made only with the actual exchange of matrimonial consent at the wedding. For this and other reasons, we urge couples to refrain from such involvement and arrangements. The notes that follow are intended to explain the mind of the Church on the celebration of marriage and to present the fruits of practical experience on what makes for a truly beautiful and prayerful celebration. Since marriage is a change in one’s state of life, we urge Catholics about to be married to celebrate the sacrament of reconciliation (penance, confession). The celebration of this sacrament provides an opportunity to review the past and to look with confidence and with the assurance of God’s saving grace toward the challenges of married life. Marriages of two Catholics or of a Catholic and a baptized non-Catholic Christian take place in a church. Marriage between a Catholic party and an unbaptized party can be celebrated in a church or in some other suitable place (if not in a church, the bishop is to be consulted on what constitutes a “suitable place”). Catholics are required to observe the canonical form for marriage: that is, exchanging matrimonial consent in the presence of a properly delegated officiant and two witnesses, in a parish church. The special circumstances of interreligious marriages may dictate that the marriage be celebrated in the church of the non-Catholic spouse. In such circumstances, the bishop may grant a dispensation from canonical form. When such a dispensation is granted, it is not necessary that a Catholic officiant be present for the wedding; usually, however, a Catholic priest or deacon may proclaim a Scripture reading, deliver a homily, and/or give a blessing; but it is the minister of the non-Catholic faith community who is truly the officiant (i.e., the one who officially receives the consent of the parties). When marriage is celebrated in a Catholic church, the church is normally the parish church of one of the spouses-to-be. When neither spouse-to-be is a member of St. James or St. Jerome, we require that each Catholic non-parishioner obtain from his or her own pastor permission to be married outside the home parish. Marriage cannot be scheduled during the Easter Triduum (Holy Thursday through Easter Sunday), as the focus in these days is upon the central mystery of the Catholic Christian faith. Sunday, the day of Jesus’ resurrection, is reserved for the regular parish celebration of the Holy Eucharist. According to Catholic liturgical law, Sunday begins with Evening Prayer of Saturday (that is, at 4:00 pm Saturday). From 4:00 pm Saturday and through the whole of Sunday, wedding Masses are not celebrated. On Saturday we have these customary times for celebrating marriage: 10:00 am, 1:00 pm. We can also schedule evening weddings for any week day. Because of the special character of the season of Lent as a time of preparation for the Christian initiation of adults and generally as a time of preparation for the celebration of the central mystery of the Christian faith, the celebration of marriage during Lent is not encouraged, but can be done. 2019: Ash Wednesday is Mar. 6 and Easter Sunday is Apr. 21. 2020: Ash Wednesday is Feb. 26 and Easter Sunday is Apr. 12. 2021: Ash Wednesday is Feb. 17 and Easter Sunday is Apr. 4. 2022: Ash Wednesday is Mar. 2 and Easter Sunday is Apr. 17. 2023: Ash Wednesday is Feb. 22 and Easter Sunday is Apr. 9. 2024: Ash Wednesday is Feb. 14 and Easter Sunday is Mar. 31. Marriages of two Catholics take place in a Eucharistic celebration (Mass). Interreligious marriages take place in a celebration of the Word of God, not at a Eucharist; it is easy to understand why. Liturgy (prayer in common) is intended to unite the people gathered. It is a fact of life, given the continuing state of disunity among Christians, that Catholics cannot generally invite non-Catholic Christians to share in the Eucharist. Recognizing, however, that various faith communities share the one treasure of the Word of God, we find that a celebration of the Word of God is altogether fitting for interreligious marriages. In a celebration of the Word of God, most of the elements found in a Eucharistic celebration (except, of course, the Eucharistic prayer and the sharing of Holy Communion) remain intact. We welcome the minister of the non-Catholic party to take part by proclaiming a Scripture reading, delivering a homily, and/or giving a blessing. The priest/deacon will give you a resource for planning the wedding liturgy. Perhaps the most important part of the planning is the selection of the Scripture readings which will be proclaimed at the wedding -- the readings upon which the priest/deacon will preach. Once you have made the selection of your Scripture readings, the priest/deacon will provide you with copies for your lector(s). These copies are for the sake of their preparation to proclaim the readings; at the wedding, they will not be reading from a loose sheet of paper but from a binder whose page format is exactly the same as that of the reading on the loose sheet of paper. Good music is essential to good celebration. Our parish liturgist is our musical expert; he is ready to provide you with numerous ideas and options. If you seek additional instrumentalists or vocalists, the liturgist can likewise help you contact such persons. Friends or acquaintances who are skilled in music may be part of the celebration, if rehearsals and other arrangements are practicable. Musical selections must be in accord with diocesan policy and must be approved by the pastor. A fundamental liturgical principle is that liturgical music must be sacred music. As a rule, popular musical compositions do not fulfill liturgical requirements. Photographs and videotapes aid our recollections of the sacred moments of the marriage celebration. Photos and videos may be taken during the ceremony. Photographers should not use flash equipment. Photographers and video camera operators are restricted to designated areas of the church where they will not be obtrusive or distracting. Photos may be taken in church for 30 minutes after the celebration; all must preserve the reverence which is expected in a place of worship. Christians are called to simplicity of life. The couple should consider whether clothes, candles, flowers, decorations, and other items to be purchased for the wedding and reception are overly extravagant. The couple should avoid having an excessive number of attendants. The couple should consider the possibility of making a donation to the poor on the occasion of the wedding. The throwing of rice, confetti, or birdseed is strictly prohibited. It is a custom of questionable symbolic value which can be both dangerous and difficult to clean up. Balloon launches do not require any local cleaning-up, but it must be kept in mind that the balloons do land somewhere on God’s earth. The unity candle, while not officially a part of the wedding liturgy, may be included in the wedding if the spouses-to-be find it meaningful. The candles are to be provided by the couple. The candles are placed, not on the altar, but on a separate unity candle stand which the church has. Alcohol and other mood-altering drugs are absolutely prohibited from the scene of the liturgical celebration of marriage, whether such drugs be in cans, bottles or bloodstreams. The wedding rehearsal is to begin on time. The marriage license and all church fees should be presented to the priest at or before the rehearsal. The marriage license must be obtained from the county clerk of Madison County in Edwardsville. The license is valid for a period of sixty days beginning the day after the license is issued. For parishioners, there is a stole fee of $50 which goes to the parish and is due at the time of the rehearsal. Payment for the services of the parish instrumentalist [supply]. (Stipends for vocalists and other musicians are to be negotiated separately.) For non-parishioners, in addition to the above, there is a surcharge of $100. Everybody knows what a wedding is supposed to look like. We think of a “bride’s side” and a “groom’s side” in church; we think about the bride and groom not seeing each other until their procession into church; we think about several bridesmaids and groomsmen; we think about small children serving as ringbearers and flower girls; we think about the father of the bride “giving her away” to the groom. Well, the Church’s Order of Celebrating Matrimony does not presuppose any such arrangements! There are sound reasons for the simplicity of the Church’s official rite. Let’s look at what the rite actually says and consider its built-in wisdom. PLEASE NOTE THAT OUR COMMENTS HERE ARE NOT POLICY BUT ARE SIMPLY SUGGESTIONS WHICH WE HOPE YOU WILL CONSIDER. There is an assumption that the bride and groom are at the door of the church, perhaps together greeting members of the assembly as they enter the church. As attached as we may be to the custom of the bride and groom not seeing each other until they process in, we must also recognize that this custom harbors an element of superstition -- and the Christian faith will have nothing to do with superstition. How much more friendly, welcoming, and downright human to have the couple together and greeting their loved ones as they prepare to pray and celebrate together. The bride and groom process in a way that emphasizes the freedom and willingness of each of them to enter into marriage. We do not have here a picture of a lonely man waiting for the father of the bride to hand her over to him. Instead, we see two persons exercising their freedom. When was the last time you sang an entrance hymn at a wedding? We suppose that instrumental processionals are the only way to begin a wedding. But why should this celebration be any different from any other Eucharist or Liturgy of the Word? The congregation is to stand as we stand at the beginning of any other worship service. There is no script regarding the father of the bride “giving her away.” He doesn’t give her away. She is making her own free commitment. A small wedding party is described above. There is no mention of ringbearers or flower girls. When a ringbearer/flower girl plan “works,” one witnesses an effect similar to that found in the animated cartoons of Walt Disney and adopted in recent years in the films of Steven Spielberg. Little animals precede or lag behind big animals. The effect is for the assembly to exclaim, “Oh, aren’t they cute!” Miniature brides and grooms! But there is no call for cute here! We are witnessing some-thing which is moving precisely because it is an exercise of one’s adulthood! Far better not to have ringbearers and flower girls! When it “works,” the effect is one of distraction. When it doesn’t “work,” which is very often, tiny tuxedoed tots cower in terror as if they have to approach the Great and Powerful Oz! We don’t need that spectacle either. Every effort must be made to remind the congregation that they are here not to watch a show but to participate in worship. There is an opening prayer and then we are seated for the reading of the Word of God. The lector should be a practicing Christian who knows how to proclaim -- and not simply read -- the Word of God. The responsorial psalm is, preferably, sung. It is possible to put into the assembly’s programs the music for the psalm response. We stand for the Gospel and are seated for the homily. Then comes the marriage rite itself. Note that, according to the Order of Celebrating Matrimony, “All stand, including the bride and bridegroom.” Again, the assembly’s standing at this time is their affirmation of this solemn act of matrimonial consent. The assembly is not a passive audience. Marriage is something that the spouses confer upon each other. It is their consent which “makes” the marriage. The priest or deacon must be present for the validity of the marriage, but his role is minor. Fr. Kevin likes to do the marriage rite with his back to the congregation and with the wedding party turned around so the congregation can see them. The bride and groom must speak loudly and clearly. We are here to witness their commitment. Most of the time, couples have the priest or deacon give them the words of consent, so they can simply repeat them. How much better for the bride and groom to memorize the formula of consent so that they can speak it with authority! We who live at the dawn of a new millennium have been able to reap the results of the hard work of many people in many fields of endeavor. The twentieth century saw the advent of a body of insight into human personality and relationships -- the insight known as psychology. In our time, millions of people are learning to look at themselves in new ways. They are able to shine a light upon aspects of their personalities that previously had remained hidden and misunderstood. They are able to better understand themselves and others, especially those to whom they are committed in marriage. Self-knowledge is a very hard thing to come by. Yet it is only with adequate self-knowledge that one can really give of oneself as a spouse and allow the marriage relationship to be dynamic and growing. Spouses are committing to a community of the whole of life. Marriage simply cannot be without real intimacy. Intimacy does not refer to a conjoining of bodies. Intimacy means willingness to know oneself, to accept and love oneself, then in turn to be willing to let another know one as one is, and to accept and love the other as he or she is, and, finally, willingness to seek the personal and interpersonal growth that becomes an obvious goal as personal shortcomings are revealed. Many factors may block this ideal state of intimacy, and much of the time, the assistance of a psychological counselor is necessary. I would want to be certain that my intended spouse loved me enough to be willing to seek help with me if the need were to become clear. Seeking help is not a sign of failure or weakness. It is, in fact, the act of strong, loving people who approach life fearlessly. Spouses-to-be should make it an expectation of each other that they will unhesitatingly seek such help as needed. If one is unwilling to commit to such an expectation, the question “Why not?” is entirely fair. Sister Rose Miriam Schulte, O.P. Marriage is meant to last a lifetime. Proper preparation and joyful celebration will help a marriage last. As we seek to make this policy a practical reality, we pray that we administer it with true love, care and concern, that engaged couples and all the Church may feel more deeply the love of Jesus, the Church’s bridegroom. Marriage is an intimate community of life and love between a man and a woman which is directed toward the good of the spouses and the procreation and education of children. By the design of God who created human nature, marriage is both permanent and exclusive. For a Catholic to be in a valid marriage recognized by the Church, he or she must be married in a Catholic Church Worship Building with a priest or deacon present (unless a dispensation is granted). If an individual is presently divorced and not cohabitating or remarried, he or she is, in fact, free to participate in the Sacraments of the Catholic Church. Whether Catholic or non-Catholic, if an individual has been previously married, he or she needs to have the previous union(s) nullified before they can enter into a recognized marriage in the Catholic Church. This process can be tedious but can lead to a great amount of healing. Our trained staff will assist you in any way possible to make this process easier for you. Children born to a marriage which later is declared invalid are considered legitimate in every way. It is against the practice of the Church to judge children in the light of their parent’s marital status, whether that union be valid or invalid. When an individual is in a marriage not recognized by the Church, he or she is prohibited by the law of the Church from receiving the Sacraments, including Communion. The fees for seeking a nullity are anywhere from $10 - $450. The diocese will bill you when your case has been presented and accepted. Inability to pay the fee will not delay or interfere with the processing of your nullity. The entire process takes between one week to one year (depending on your individual situation). Anyone who is uncertain about his or her marital status or desires greater clarity concerning such issues should contact the parish office. The complexity of these issues requires individual attention by a priest, advocate, or tribunal. All persons seeking a nullity are to contact the Pastor at St. Jerome Parish Office. They will then be assigned an advocate to assist in the processing of their case.